Despite all the awareness sessions and efforts made by individuals, support organizations and women activists, the statistics for women education in Pakistan are still low. To a large mass, educating a girl is just about sending her to school till grade 5 and that should be sufficient for her. A large number of our society still lives in oblivion and ignores women empowerment, it ignores how important it is to strengthen this gender for so many reasons. If educated and trained to face the world, they can prove they are no less intelligent than men, or worthy to balance the scale of economies for their families and even this country, to stand up for the right and decline the wrong, to vote, vouch & express their thoughts fearlessly, deny mental slavery and train more empathic, strong & just line of generations. Like many NFP organizations operating in Pakistan working towards promoting education & professional training among women, we have another program along the same lines which is not just restricted to Pakistan. 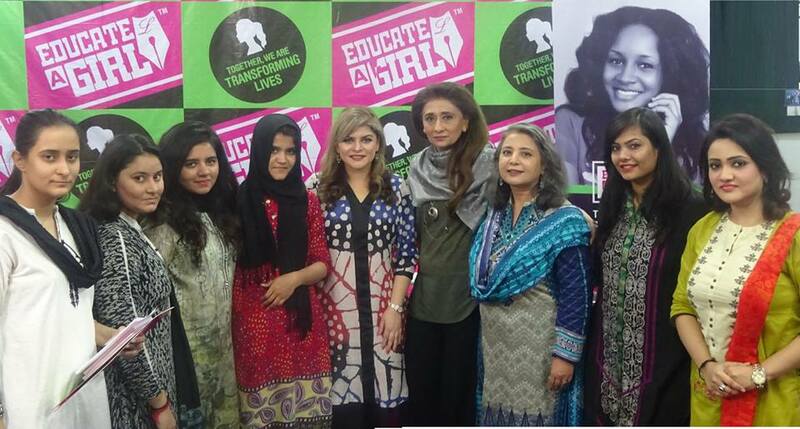 Educate a Girl is a charitable program aimed at providing scholarships to girls in Pakistan and Nigeria. The scholarships are to be used on media-related educational programs, enabling these women to have a greater voice in media. Each scholarship is USD 100, and a donor’s name is attached to each. Top scholars get placed into media outlets. Lately 250 deserving & hungry-for-education young girls of Nigeria, who live in daily fear of oppression by local terrorist forces, were trained in Lagos, along with two Pakistani “Educate A Girl” delegates by renowned journalist, Dr. Fouzia Khan. The training focused on personal and professional grooming for success, basics of journalism, challenges of climate journalism & Woman network leadership. There is a cultural and gender bias there which discourages women employment in important spots specially in the media industry and this program aids in increasing women representation to hold influential jobs in Nigeria. Educate A Girl aims to empower 1000 low income – high spirited young women from 5 continents, provide them scholarships for vocational training in media and facilitate their entry into related jobs to strengthen their social and financial standing in the society. The reason to choose Journalism as the focused field here is to allow women to make their opinions heard. This program currently partnered with the British High Commission, Swiss Consulate, British Deputy High Commission and UNDP & Pakistani High Commission in Nigeria. The Educate a Girl scholarship is organized by LADIESFUND, a platform of Dawood Global Foundation. Dawood Global Foundation is a global non-profit, non-governmental organization founded in 2010 aimed at promoting women’s education. Its founder, Tara Uzra Dawood, is a Harvard Law School alumnus.